Today’s breakfast was Buckwheat berry pancakes and canadian bacon. I was really looking forward to this meal last night. I was still a bit peckish when I went to sleep, and I woke up the same way. The meal wasn’t bad. 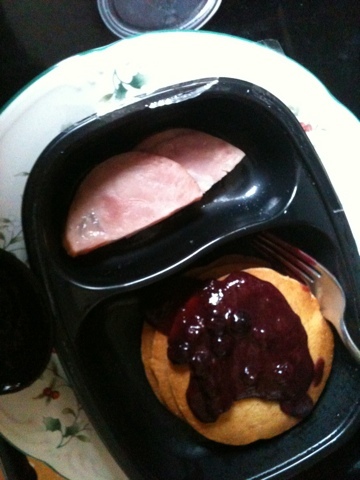 I think I may have overcooked it slightly because the pancakes were a bit dry even with the berries on top. The Canadian bacon was a little too grisly in spots to be completely enjoyable. It was also a bit sad that I had to leave a few bites on the plate, but I didn’t want to eat gristle. For 330 calories, I think I’d rather have a Spinach and Mushroom omelet like yesterday’s breakfast. Also had a snack of Dole single serving peaches in Juice and Breakstone’s 100 Calorie Cottage Cheese for a snack around 10:30.